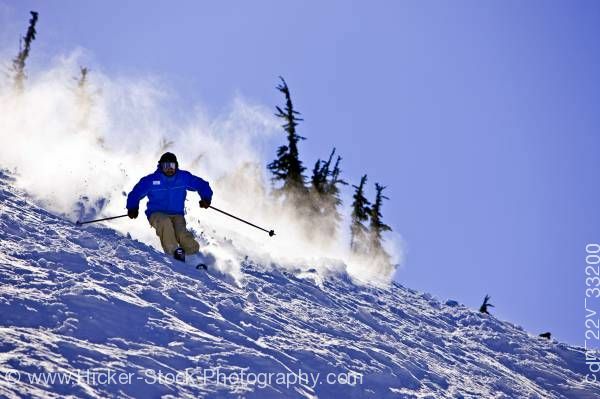 This stock photo shows a skier on the upper slopes of Whistler Mountain, Whistler Blackcomb, Whistler, British Columbia, Canada. The primary skiing terrain starts about 1/3 up the mountain. A ski-out to the valley is usually possible during the months of December through April. The overall lift capacity, 65,507 skiers per hour, is the greatest in North America, although only slightly greater than Vail Ski Resort in Colorado. Whistler Village, which is part of the Resort Municipality of Whistler, is situated at the base of the Whistler Mountain Village Gondola and Blackcomb Excalibur Gondola. The Village incorporates community services, shops, entertainment venues, restaurants, bars, hotels, condominiums and vacation properties. The Village is 675 m (2,214 ft) above sea level, and is located 137 km (85 miles) from Vancouver International Airport.